The United States Congress designated the Big Lake Wilderness (map) in 1976 and it now has a total of 2,144 acres (2143.8 acres, technically). All of this wilderness is located in Arkansas and is managed by the Fish and Wildlife Service. Twenty miles west of the Mississippi River, the Big Lake Wilderness serves primarily as a migration habitat for ducks and geese using the Mississippi Flyway. The Wilderness lies flat, approximately 240 feet above sea level, and consists of interspersed wooded swampland. During flood periods, 99 percent of the Wilderness may be submerged in water. Pondweed grows on the water's surface, supplying food for waterfowl. 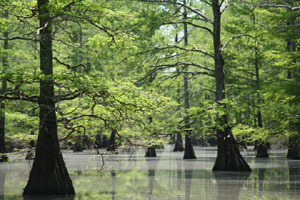 Giant bald cypress, black willow, and buttonbush thrive in swampy areas, while drier ground supports species such as cottonwood, oak, river birch, green ash, and red maple. White-tailed deer and many smaller mammals inhabit the area, and in 1993 the first bald eagle eggs hatched in nests just south of the Wilderness. No trails exist. Regulated hunting and fishing are permitted. Big Lake is the state's smallest Wilderness and the only one in eastern Arkansas. Planning to Visit the Big Lake Wilderness? How to follow the seven standard Leave No Trace principles differs in different parts of the country (desert vs. Rocky Mountains). Click on any of the principles listed below to learn more about how they apply in the Big Lake Wilderness.